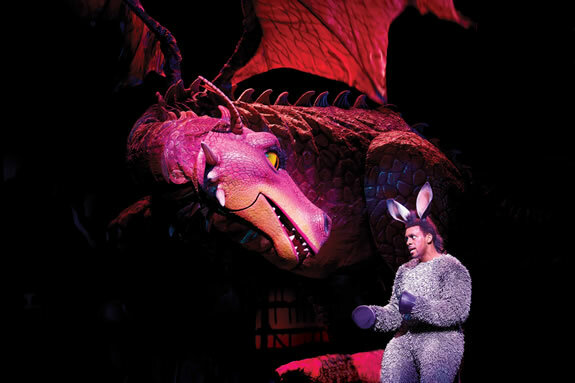 Shrek the Musical was always going to be a relatively easy sell, but not necessarily so artistically sound. The original 2001 smash hit movie was a fresh, unexpected riff on the fairytales of old and their Disney re-imaginings; witty, playfully irreverent and treading the perfect balance of appeal for young and old alike. So much of it’s dialogue, humour and characters have become instantly recognisable, quotable and inimitable that it was difficult to imagine a stage-bound musical adaptation being anything other than a slavishly loyal re-tread with key sequences stretched out to accommodate a showtune or 17. 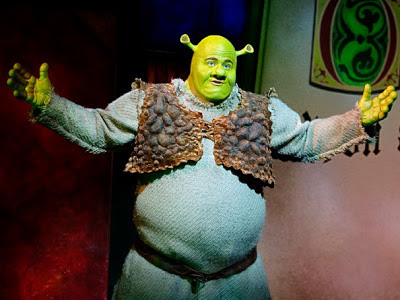 Fortunately, Shrek the Musical manages to mostly carve out its own identity whilst staying true to the film whilst rekindling a dash of the originals wit and post-modern spark by turning it’s parodic, referential gaze to other West End/Broadway shows and peeling back a few more of those onion layers of it’s key characters. It’s two leads, Shrek and Fiona, for instance, are given slightly more established backstories that instantly cement them as kindred spirits, a neat touch that is now surprising in its obviousness and absence from the movie, and villain-of-the-piece Lord Farquaad is likewise given some exposition which, rife with irony and allusions to the fairytale creatures he is so intent on expelling from his kingdom, is again a clever, illuminating addition. With the exception of these extra character beats, naturally most of which are explored or given extra weight in song, the story mostly follows the plot of the original movie relatively unaltered. Shrek - an outcast, irritable ogre living a life of solitude and grimy excess in a swamp is forced to rescue the imprisoned Princess Fiona in order to win back his home after it is invaded by a menagerie of evicted fairytale misfits. Along the way he befriends a wise-cracking talking donkey, must overcome the machinations of the diminuitive Farquaad, engages in plenty of child-friendly toilet humour, and becomes embroiled in a fairly atypical love story which once again extolls the virtues of internal beauty being more important and meaningful than what you see at face value. Back in 2001 this was a relatively original idea in its execution and target audience, but with three Shrek sequels and a plethora of more inventive and original outings in both film and theatre aimed at a family audience having come since (mostly courtesy of Pixar), the shows story and message comes across here as assuringly familiar as opposed to the inventive, somewhat satirical reversal it once was. 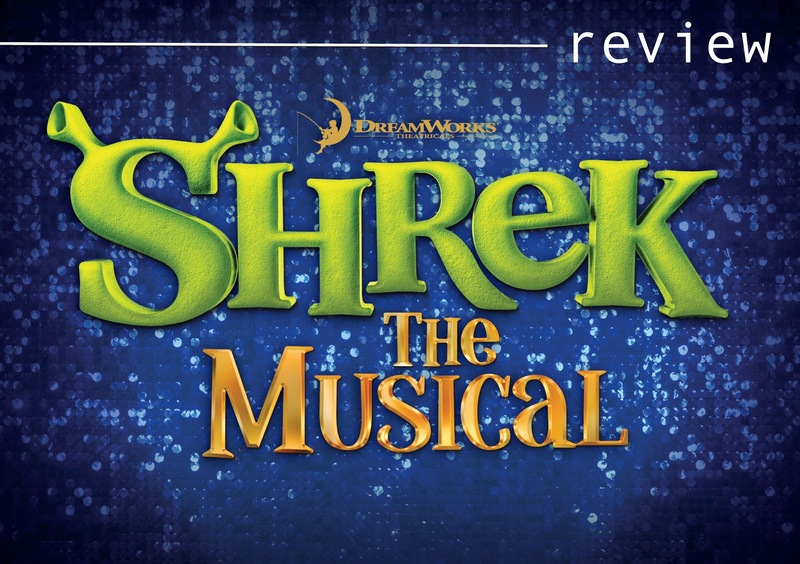 Much the same can be said of the soundtrack, which, whilst suitably peppy and featuring one or two notable numbers (mostly assigned to either Fiona or Farquaad), generally misses out any key moments or high notes, and doesn’t quite cement the need for the story to be given this musical treatment. As mentioned, there is some neat character development, and plenty of fun to be had throughout, including musical references to the likes of Wicked, Dreamgirls, Gypsy and even Once Upon a Mattress knowingly scattered throughout that is in-keeping with the referential tone and will surely be appreciated by musical afficianados, but generally speaking after seeing the likes of recent productions such as Sister Act and Matilda: The Musical much more successfully mould their music and song into their raison d’etre for being brought to stage, it’s hard to not feel a trifle disappointed by the soundtrack Shrek offers. Fortunately, there is plenty more invention in the stage design and visuals. 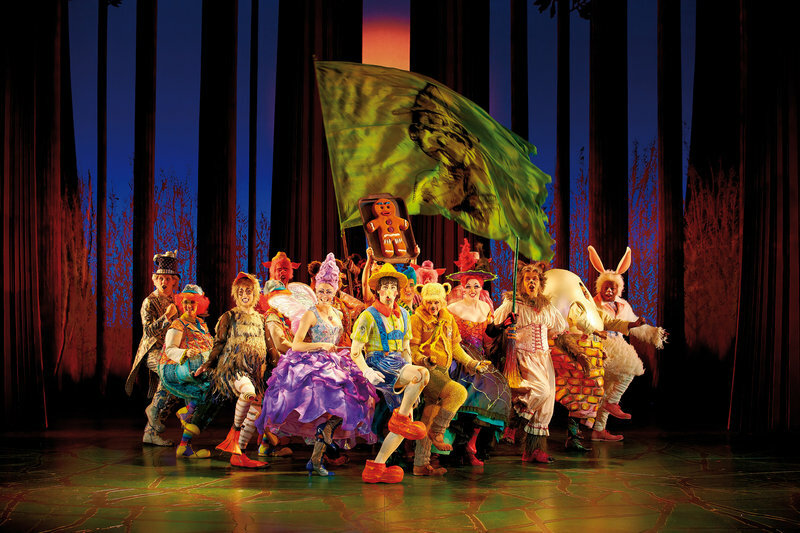 From Tim Hatley’s vibrant, whimsical stage design that slightly heightens the slightly more naturalistic design aesthetics of the original film, through to the wonderful costume and make-up design for the assortment of characters throughout, Shrek the Musical is a treat for the eyes, even if some of the key moments in the film naturally have to be lessened in scope and event (such as the dragons keep bridge sequence). Again, as with the soundtrack, there are plenty of winks and nudges elsewhere in the design, including a great spin on the iconic ‘Cosette’ imagery from Les Miserables during an Act 2 number. One real sequence of visual delight is undoubtedly the superb puppetry work done in bringing the character of ‘Dragon’ to life, which, coupled with Landi Oshinowo’s stunning vocals and one of the strongest numbers (‘Forever’, a brilliant mo-town/soul belter) makes it one of the highlights of the entire show, and fortunately a notable step up from the original staging, song and puppetry of the Broadway production (all of which were completely different and can be seen HERE). Similarly impressive are the majority of the central performances, with Dean Chisnall perfect as the titular role, immediately reminiscent of Mike Myer’s original take on the character without resorting to outright imitation, and boasting some great vocals where the soundtrack allows him. 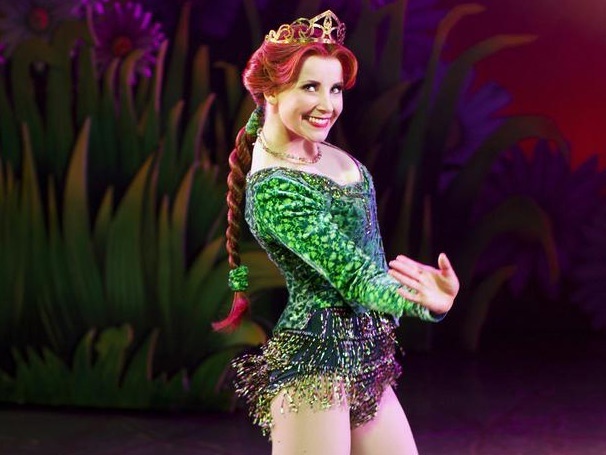 Carley Stenson is flighty and funny as Fiona, throwing herself fully into the innate comedy of the role and bringing a whimsical yet sassy edge to the character. The aforementioned Landi Oshinowo blows practically everyone off the stage vocally as both Dragon and the Ugly Duckling, and the supporting company bring the fairytale ensemble to life with real vim and vigour, particularly Alice Fearn as Gingy and Jonathan Stewart as Pinocchio. The two extremities of the cast are Neil McDermott as Lord Farquaad, and Richard Blackwood as Donkey. McDermott is helped in large by the brilliant, instantly-hilarious visual interpretation of the small-in-stature Farquaad, though he compliments this with an equally inspired performance, showcasing some terrific comic instincts, timing and comedic chops, and a laugh-out-loud turn throughout which completely steals the show. There are traces of original Farquaad John Lythgoe to be heard in the voice, and whilst McDermott may not have the strongest singing voice to be found in the West End, he’s certainly giving one of it’s most consistently enjoyable, engaging and hilarious musical performances. The same unfortunately cannot be said of Blackwood, who generally flatlines as Donkey and not only coasts vocally, but generally came across as somewhat unenthused and lackluster in performance throughout. The original Eddie Murphy creation of Donkey remains one of the most iconic components of the Shrek franchise, so credit must go to Blackwood for also not resorting to base mimicry, but so much of the wit and impact of the characters dialogue generally fizzes out, and the less said about his signature ‘Travel Song’ the better. It’s unfortunate that such an integral part of the production is so lacking, as the role has plenty of potential and is so prevalent that it is immensely disappointing to repeatedly see the humour, vibrance and even pathos sucked out of the character and key scenes throughout. Ultimately though, for all the praise or critique, Shrek the Musical generally succeeds as an entertaining, occasionally dazzling musical experience that will certainly engage a younger audience. If you're under a certain age, or manage to catch one of the Donkey understudies performing the role then chances are you'll probably want to throw an extra star onto the rating. Blackwood will no doubt disappoint ardent fans of the films regardless of age, though thankfully the rest of the cast (particularly McDermott) help pick up the slack, and whilst it may not be as clever or resonant as the film which inspired it, it is colourful, lively, frequently funny and bounces along at a swift pace with some fun (if unambitious) tunes throughout. If you are looking for the perfect West End musical experience for the whole family, then your first port of call should probably be the far superior Matilda: The Musical, but if not, then you’ll certainly find plenty to enjoy by seeking out Shrek. 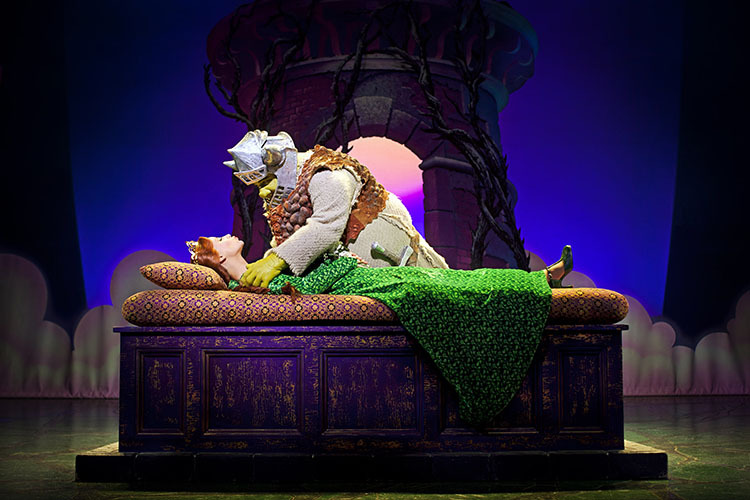 SHREK THE MUSICAL is currently running at the Theatre Royal Drury Lane, London. Alternatively phone See Tickets on 0844 871 8810. Press tickets for this performance of Shrek the Musical were provided courtesy of CornerShop PR, London. (A)musings Media gratefully acknowledges their generous invitation. 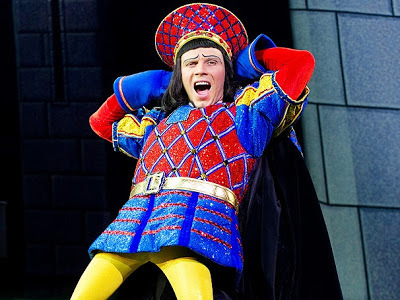 Its a shame that neil mcdermot didn't win the olivier award, he's so much better as farquaad than nigel harman. Saw nigel twice and he was good but just seeing neil the once he was way better. 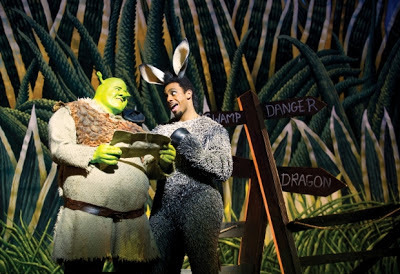 I agree that richard blackwood is no good as donkey but I heard his understudy is a lot funnier. Heya Alisha, thanks for commenting. Unfortunately that's the way it works with Olivier awards and I agree it's a shame that sometimes superior performances that come after the original actor don't get the same opportunity. Still, credit must go to Nigel Harman for originating the role (in the West End at least). I have heard the same about the Donkey understudies, there are two at the moment, and hence mentioning them in the review. Still am amazed that Richard Blackwood has been kept on for so long when he saps such energy and zing out of so many of Donkey's scenes and lines. Saw this on sunday and thought Richard Blackwood wasnt too bad as donkey. Maybe not as funny as Eddie murphy but I think thats just because everyone thinks of him as the character and knows he did it first. Me and the family all enjoyed it and really reccomend it to families looking for a show to see at christmas.